Rhys Priestland wants to be part of ruthless Wales win against World Cup minnows Uruguay on Sunday. But the Bath signing does not believe he will make Wales' starting XV against tournament hosts England next Saturday no matter how well he performs. "It does not take a rocket scientist to work out what the team will be against England," said the fly-half, 28. "Sunday might be the only opportunity some of us get, and we all want to make a mark on the World Cup." The former Scarlets player has been Dan Biggar's understudy since his last Wales start in November, 2014. With Biggar rested along with front-line men Jamie Roberts, George North, Alun Wyn Jones, Taulupe Faletau and Gethin Jenkins, Priestland partners Scarlets' Gareth Davies at half-back. "No matter who you are playing against, you want to put down a marker early doors and show we are fit and ready, and if we are called upon they can place a bit of trust in us," said Priestland. 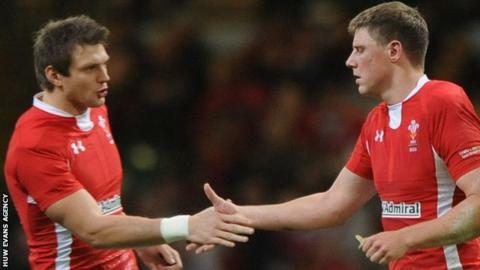 Priestland was one of Wales's stars as they reached the World Cup semi-finals in New Zealand four years ago. But since then he has at times felt the wrath of Wales fans amid patchy fitness and form. Having been booed by Wales fans at times, Priestland says he has come to appreciate his Test chances. "I have taken a bit of stick, but there are worse things I could be doing," he said. "There have been times when I have not enjoyed it as much, but they are behind me. "I have enjoyed the summer with the squad, the training and the [warm-up] chance I had in Ireland, and I hope there will be a few more opportunities in the coming weeks to show what I can do and how much I am enjoying my rugby. "You do get down, but you quickly realise how fortunate you are. The bad times did not last that long, really. "I think I am a better player than four years ago." Priestland believes Pool A, which also includes Fiji, Australia and hosts England, could be decided by points difference, hence the need for Wales to keep the scoreboard operators busy against Los Teros. "We will not feel sorry for anyone. I have been on the back of hidings, and I am pretty sure they would not have felt sorry for me," he said. "It is the World Cup at the end of the day, and we have to be as ruthless as we can."